There are some people I know from being on the bike and nowhere else. Rick B. is one of those people. We’ve never seen each other in our “real lives,” only our cycling lives. I’ve come to know Rick from my morning commute, where our routes occasionially cross paths. 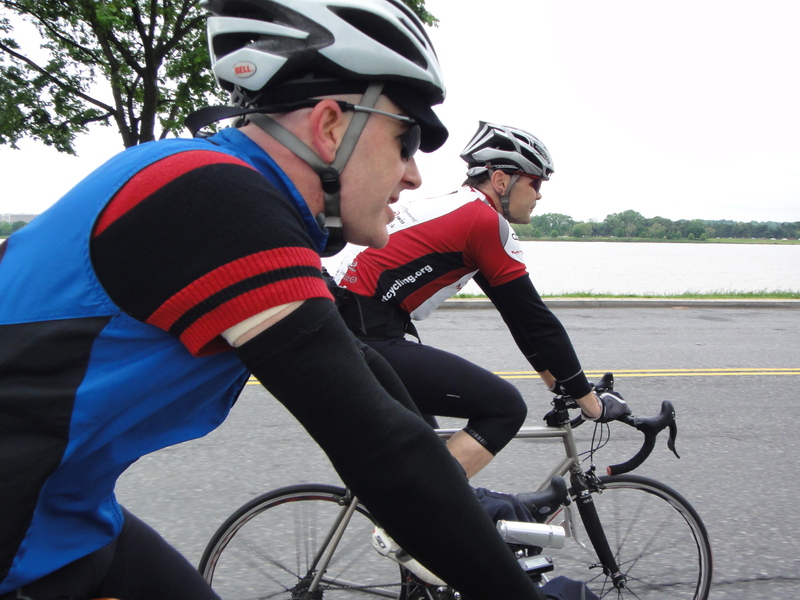 Rick and Felkerino know each other through weekend rides with the C&C Climbing Factory. Rick may be speedy (I think he’s not carrying enough stuff on his commute! ), but he always takes time to say hi and chat with Felkerino and me. Rick commutes on a lovely Merlin and, since I wanted to find out more about it, I asked him if he’d be part of Bikes to Like. Rick said yes, and below is the story of his bicycle. Merlin Extralight, in stealth mode as almost all the decals (and currently even the headbadge) are removed, 59 cm, Campy components. 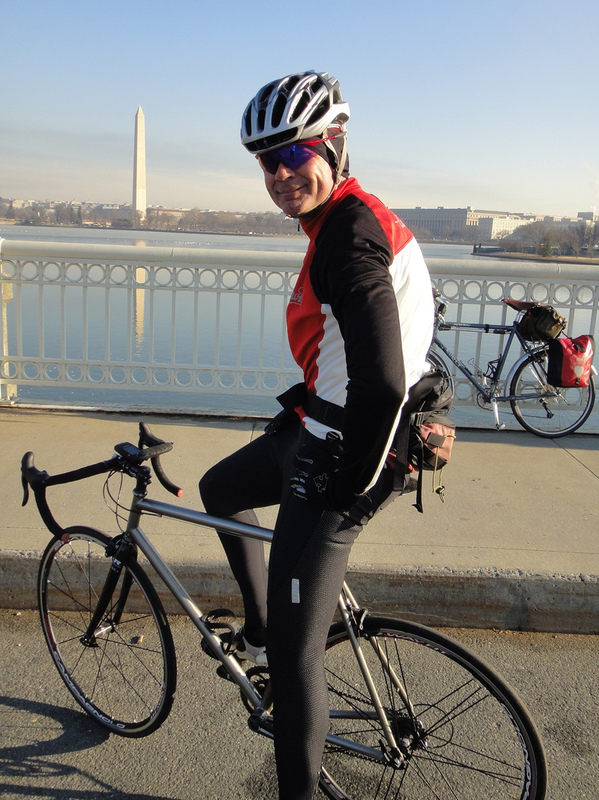 Merlin is my main bike for commutes from North Arlington to Foggy Bottom, taking a roundabout route in the morning (18-27 miles) that usually includes a couple of laps of Hains Point, where I’ll sometimes find Mary and Ed and other old friends. In the evening, I’ll typically take a more direct route (6 miles). It also gets some use on longer weekend rides, especially in winter. Merlin fits me well, has a comfortable ride, and will last forever. Its been incredibly versatile over the years; good for racing up Mt Mitchell, double centuries and mellow touring, as well as commuting. Also, its quite a magnet in Italy, where frames made of “titanio” are rarely seen. Confession time — I am a fair weather cyclist. Conditions that would warrant fenders have me braving the Metro. My Dinotte light. It’s light, bright enough for the city streets and bike paths where I commute, and using rechargeable AAs is very convenient. At 17 years old and what must be well over 100,000 miles, its approaching ripe old age for a bike. 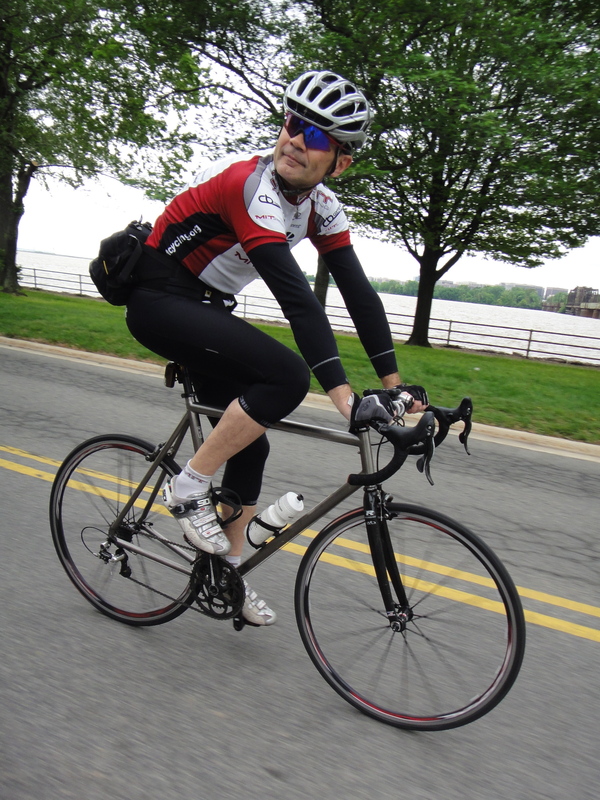 Although a lighter carbon frame is now my first choice for aggressive rides, Merlin’s ride characteristics remain excellent, and my commutes on it are great times with an old friend. Thanks, Rick. It’s always a pleasure to run into see you and your bike on the commute! I love those Dinotte lights! I’ve got 4, two 400R tail lights, a 400L front and a 800L. Last week one of the tail light switches died. I called Rob at Dinotte and he had me disassemble it. No luck with a fix, so I sent it to him, they’ve repaired it for free and it’s on it’s way back. $30 plus send the charger and battery along, and then I had both the charger, then the battery die. I don’t know why I bothered the second time. But if anyone is looking for a cheap NiteRider I’ve got one. Love your bike. I have an old Extralight myself. I am wondering if would part with the headbadge you say you are not using (for a price?). I went stealth for a while and now have re-decaled and am looking for a badge.